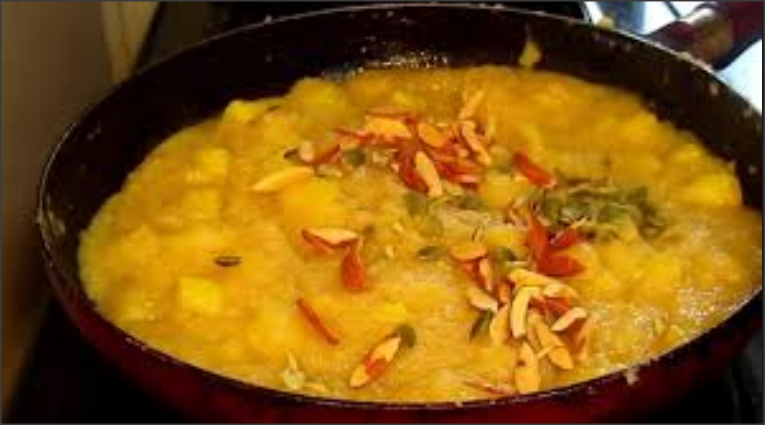 An unusual dessert by Chef Rida Aftab with a bit of a kick – the good news is this dessert is ready in minutes, easy to cook and delicious to eat! First of all cut pieces of pineapple. In frying pan heat butter, add pineapple pieces, milk and saffron. Cook on low flame. After this add sugar. When the sugar water gets dried, add khoya and turn off the flame. In the end dish out and pour out finely chopped almonds, spread few edible silver leaf.